In Cuban Culture, roast pork, or lechon asado, is the meal served on all special occasions. 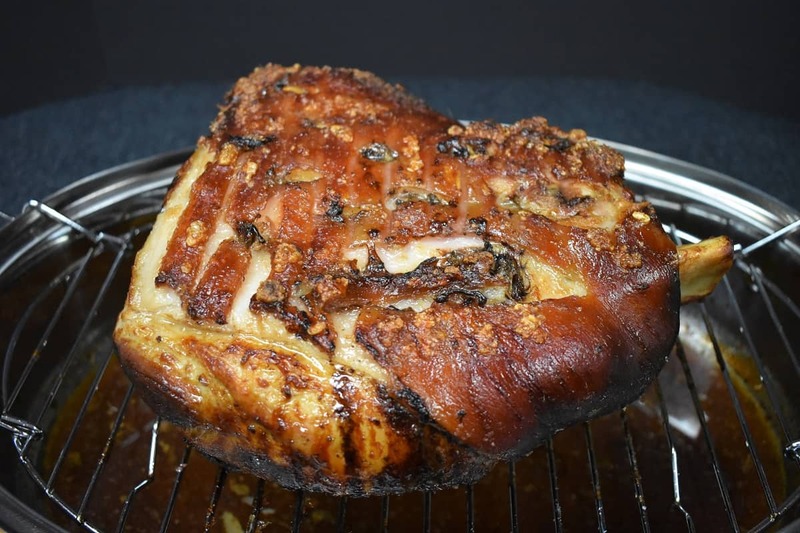 Christmas, Weddings, New Year’s… roast pork is on the menu. This is a traditional recipe using a homemade mojo marinade. 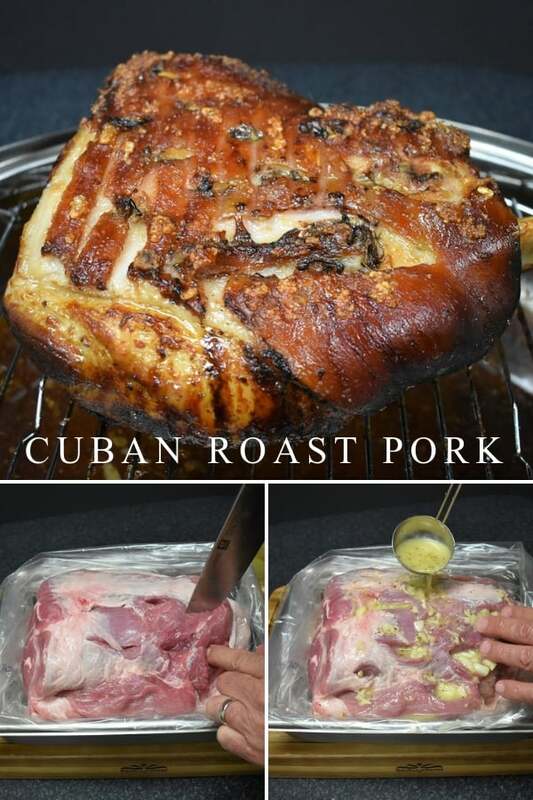 Cuban roast pork is a two-day event. The pork needs to marinate in the refrigerator overnight. Then you roast it, low and slow for hours, so make sure you plan for that. Oh, and something else to plan for, have plenty of snacks on roasting day because while that pork is cooking your house will smell amazing. Everyone will be asking: “when will it be ready?” “Is it ready yet?” Enjoy! Peel the garlic. Reserve 8-10 whole garlic cloves. Smash the remaining garlic cloves; place them on a cutting board and give them a good whack with a meat mallet. Add the smashed garlic, sour orange juice, olive oil, oregano, cumin, 1½ tsp. salt, and the bay leaf to a medium bowl or jar. Stir or shake to combine well. Let the marinade sit in the refrigerator for at least 1 hour, a couple of hours is better. Shake or stir well before using. Cook’s notes: We lined the pan with a large roasting bag (I think they’re made for turkeys). We found them in the foil and plastic wrap section of the supermarket. These bags are great, they contain the mojo and you can seal them tight with a knot. Turn the pork over (skin side down) and make about 10-12 small slits (about 1-2” deep) in the meat. Using a ladle or spoon, start pouring the marinade into the slits you made. Then pour the remaining marinade over the pork. Sprinkle another ½ tsp. or so of salt over the pork, if desired. Seal the bag by making a tight knot on the top, or cover the pan well using a generous amount of plastic wrap. Seriously use several layers. The smell of this marinating pork is strong and will permeate the refrigerator. While the pork roast marinade is delicious, I don’t want my refrigerator smelling like it for days. Pour the marinade over the pork. Brush any loose pieces of garlic off the pork. They will start to burn quickly. Also, pour just a little bit of water in the bottom of the roasting pan. You’ll have to add a little more during the roasting time too. The drippings and garlic on the bottom of the pan will start to burn and smoke. The water keeps this in check. 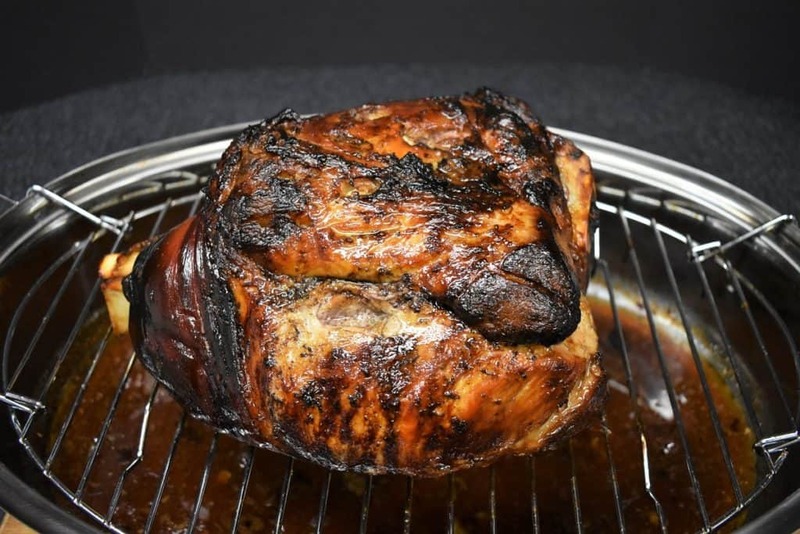 Roast the pork for 7 – 8 hours until the internal temperature reaches at least 170° F. Check the temperature with an instant read thermometer on several different spots. Fill a small bowl or cup with water and add a generous amount of salt (about 1 tbsp. for 1 cup of water), stir. 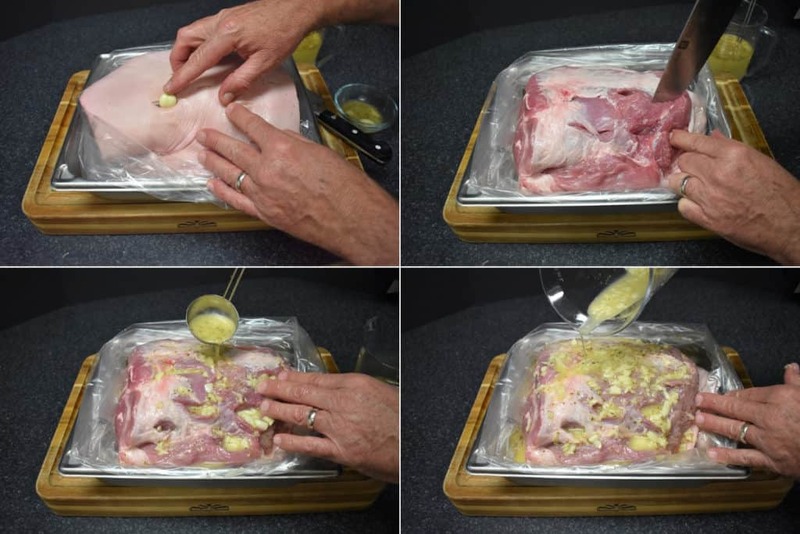 Drip the salted water on the pork roast and use a brush to spread it all over the skin. Repeat several times. If you were roasting on the middle rack, like we were, move the rack down one, just so the pork isn’t sitting too close to the heat element. Switch the oven to the low broiler setting. In Cuban Culture, roast pork, or lechon asado, is the meal served on all special occasions. 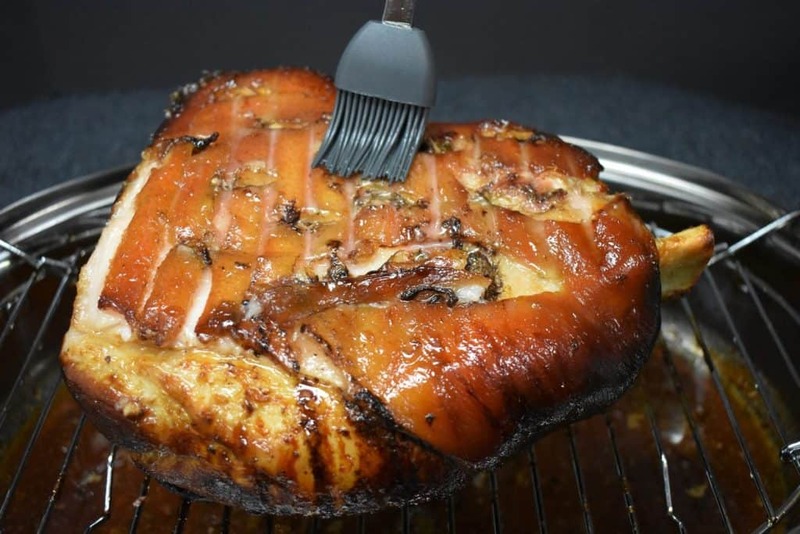 Christmas, Weddings, New Year’s… roast pork is on the menu. 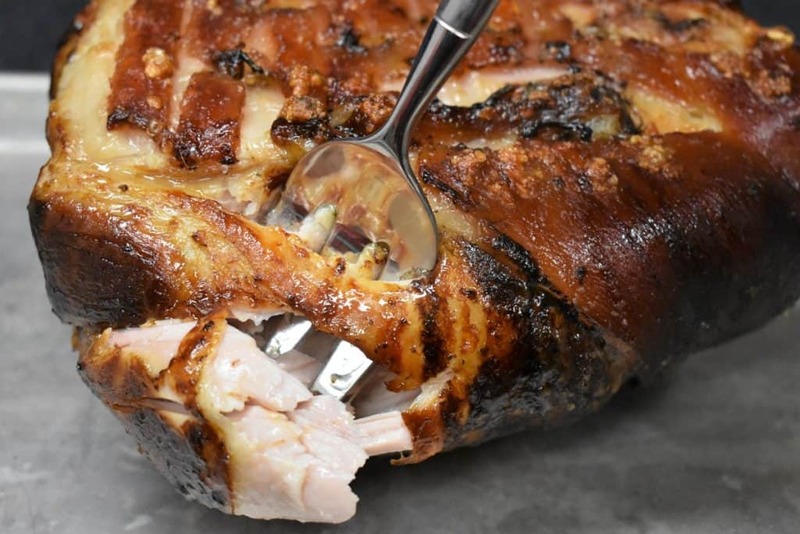 This is a traditional Cuban roast pork recipe using a homemade mojo marinade. 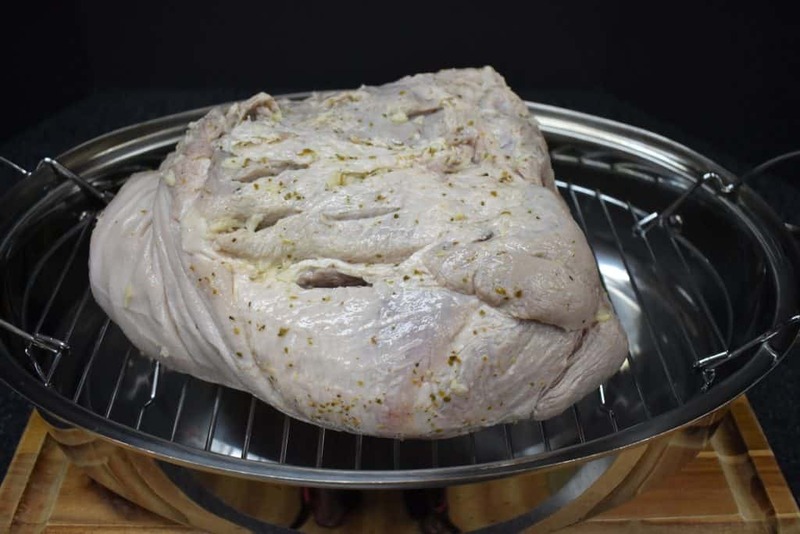 A large pan to marinate to pork, a large marinating or roasting bag or plastic wrap, a large roasting pan with a rack, and aluminum foil. About 1½ - 2 hours into the roasting time tent the pork. 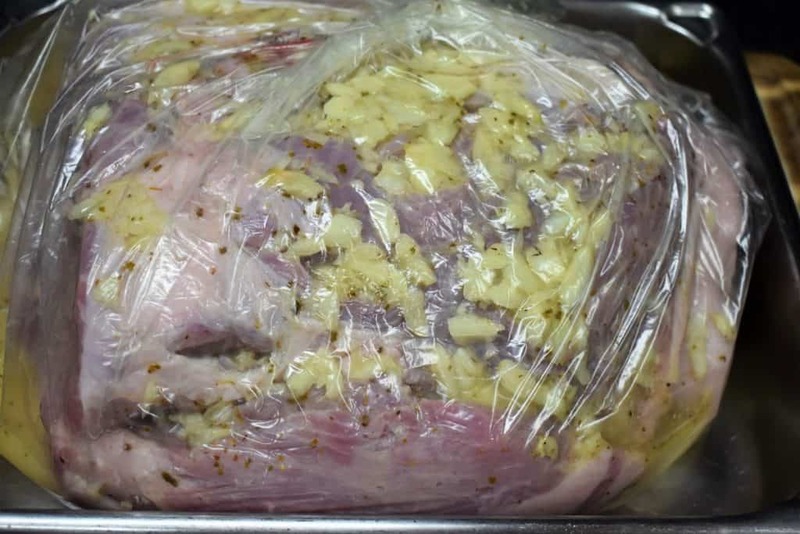 Take a piece of aluminum foil (about the size of the pork shoulder) and loosely cover. Just place it on top, don’t wrap it. If you were roasting on the middle rack, move the rack down one, just so the pork isn’t sitting too close to the heat element. I made this today, and it turned out excellent. 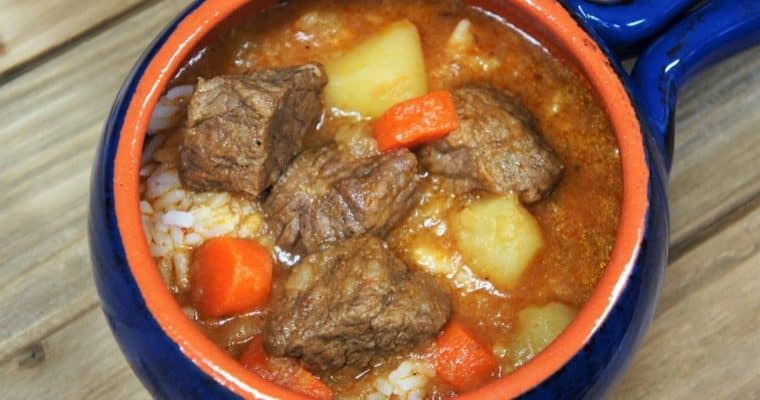 I would recommend when marinating the meat to use either a small cooking bag (I used turkey sized, which was far too large) or a large bowl or even placing a cooking bag with the meat inside of a bowl in order to more evenly marinate the meat. I used 2 large silicone kitchen tongs to rotate the meat on the rack for crisping, and they worked well. Kitchen forks might also work, but the meat is so tender that it may be torn apart by the forks. Also, make sure to add 1C of water to the roasting pan every hour or so. I added 1.5C when I put the pan into the oven, and 2 hours later I had scorched garlic in the pan. Hi Paul. I am really glad you enjoyed it. Thanks for adding the extra tips! I’ve made it 3 times and the skin is always super crispy. OMGoodness! This will be along side our turkey this Thanksgiving! While most love a good turkey on the holiday, it is not on my favorite list! This looks delish! Thanks Diana! I know what you mean. We stick to the traditional turkey for Thanksgiving but everything else, Christmas, New Year’s, Mother’s day… It’s Lechon! Enjoy and Happy Holidays!! You call for “sour” oranges. Are these a special type of orange? If they aren’t available, what would you recommend as a substitute? Hi Connie. Yes they are a special type of orange; they’re bitter and not as pretty. The color is not very vibrant, they’re greenish-orange and the skin is bumpy, not smooth. Definitely don’t want to snack on one! They’re not available everywhere, or throughout the year. A good substitute is to combine fresh orange juice and lime at a 2:1 ratio. 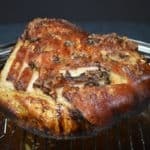 So for the mojo in the roast pork you would use 1 cup of orange juice and ½ cup lime juice and stir or shake well to combine. Take a look at our mojo marinade recipe, there is step by step instructions (including the substitute for sour oranges) and pictures. This looks wonderful but how do you recommend serving this? Sliced/chunks with sides, sandwiches? Hi Carol. 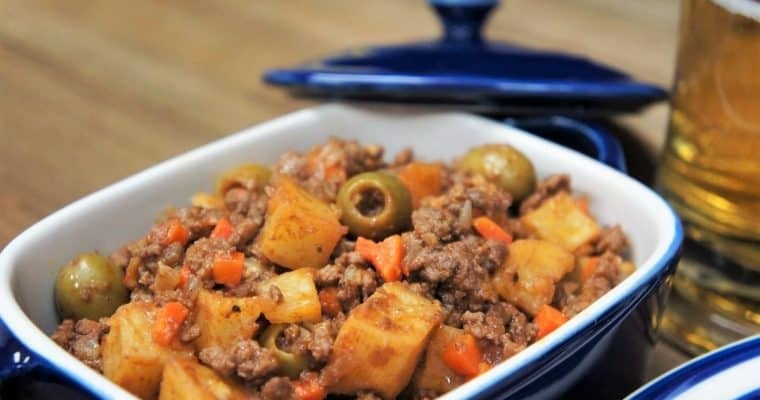 Here are some ideas…You can slice or chop it into chunks and serve it with white rice and black beans. Or, you can go the sandwich route and shred the pork (the underside especially shreds up nicely) and serve it with paper thin onions, to make a pan con lechon, or slice the pork thin and make a Cuban sandwich with ham, Swiss cheese, pickles and a little mustard. With the sandwiches, make sure to press/panini them. Hope that helps!